Cherubism, a rare hereditary fibro-osseous lesion characterized by painless expansion of jaws, starts early in life manifesting itself fully in the second decade of life and is almost regressed in the third decade. Here, we report a sporadic case of Cherubism with clinico-radiological and scintigraphic presentation of its classical features for its disease rarity and single-photon emission computed tomography/computed tomography findings with review the literature. Cherubism, a rare benign painless fibro-osseous neoplasm involving mandible and maxilla was initially characterized as familial, but both hereditary and sporadic cases have been described. In 1933, Jones described this disease  as “familial multilocular cystic disease of the jaws,” but the term “cherubism” was later coined because “the full round cheeks and the upward cast of the eyes give the children a peculiarly” cherubic appearance. A cherub is a toddler or baby angel, often portrayed in the art to have chubby cheeks and an upward gaze. The characteristic feature of Cherubism is bilateral mandibular involvement however one case report in the literature describes unilateral involvement, in an adolescent. The mean age of diagnosis is considered as 7 years with a range of 14 months to 12 years. Approximately, 280 cases have been reviewed in the literature. The benign disease is characterized by progressive cystic proliferation of the mandible and maxilla during the childhood, which is followed by self-involution in puberty  and bone remodeling in adulthood. The lesion may cause premature exfoliation of the deciduous teeth and displacement of permanent teeth. Based on the location and severity of lesions, Fordyce and Wedgwood  suggested a classification system for Cherubism. Accordingly, Grade-I concerns the involvement of both mandibular ascending rami; Grade-II corresponds to the involvement of both maxillary tuberosities as well as of the mandibular ascending Rami; and Grade-III includes rare, rapidly increasing, destructive and widely deforming juvenile cases involving the maxilla and mandible, and may include the coronoids and condyles. An 18-year-old girl was referred to our department with complaints of painless enlargement of the jaw and the loosening of teeth. Family history did not reveal any significant information about the familial origin. She had a history of hypothyroidism for 3 years of age and history of atrial septal defect (ASD) operated at the age of 4 years. The patient had anodontia since childhood, and dental development occurred only after correction of ASD. On clinical examination, there was prominent enlargement in the mandibular region. Some permanent teeth were missing, and wide edentulous interdental spaces were detected on intraoral examination. Few skin lesions were also noted suspicious for café au lait spots. Otherwise, clinical examination was unremarkable. She had attained puberty at the age of 15 years. The laboratory results of serum cortisol, calcium and phosphorus, alkaline phosphate, Parathyroid hormone, Vitamin D3, complete blood cell count, urine analysis, and liver functional tests were all within the normal range. The orthopantomogram radiograph showed misalignment of teeth with the distorted root of premolar and molar tooth and loss of few incisors and canine teeth [Figure 1]. 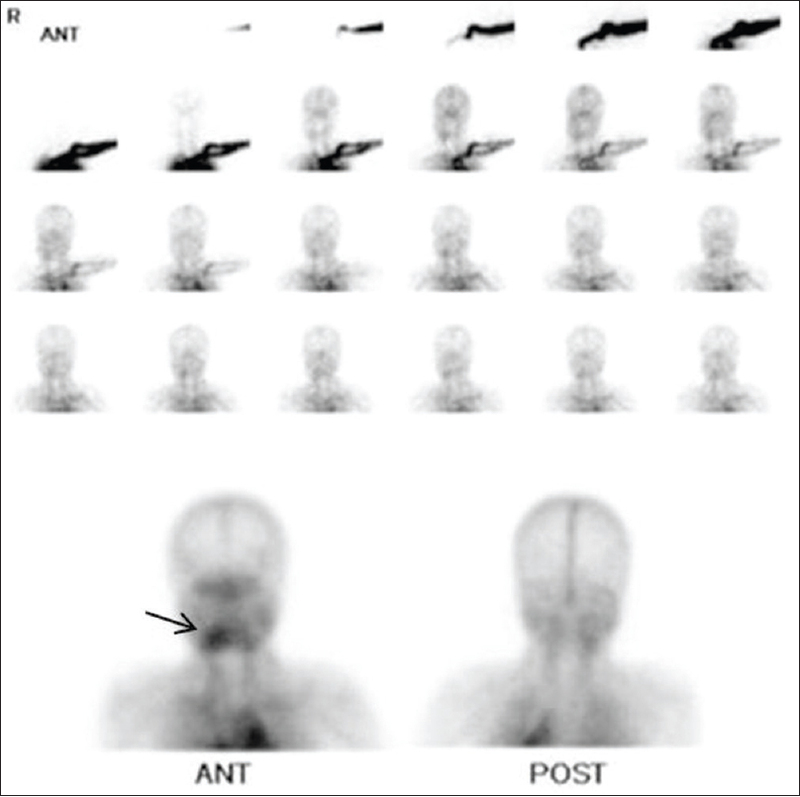 Whole-body bone scintigraphy with three-phase imaging of the skull and upper thorax was done by the intravenous administration of 20 mCi of technetium-99 m methylene diphosphonate (99 mTc-MDP). Tc-99 m-MDP first pass images of the skull and upper thorax MDP blood flow images of the skull and upper thorax shows a region of focal hyperperfusion in the right hemimandible [Figure 2] corresponding to a focal region of tracer pooling in the same region of the right hemi-mandible in the blood pool images shown subsequently. In addition to this focus, the blood pool images show mildly increased tracer pooling in rest of the mandibular and maxillary regions as well [Figure 2]. Delayed phase whole-body and static planar images showed diffuse heterogeneously increased tracer concentration involving the entire mandible and bilateral maxillary regions with evidence of bony expansion [Figure 3]. 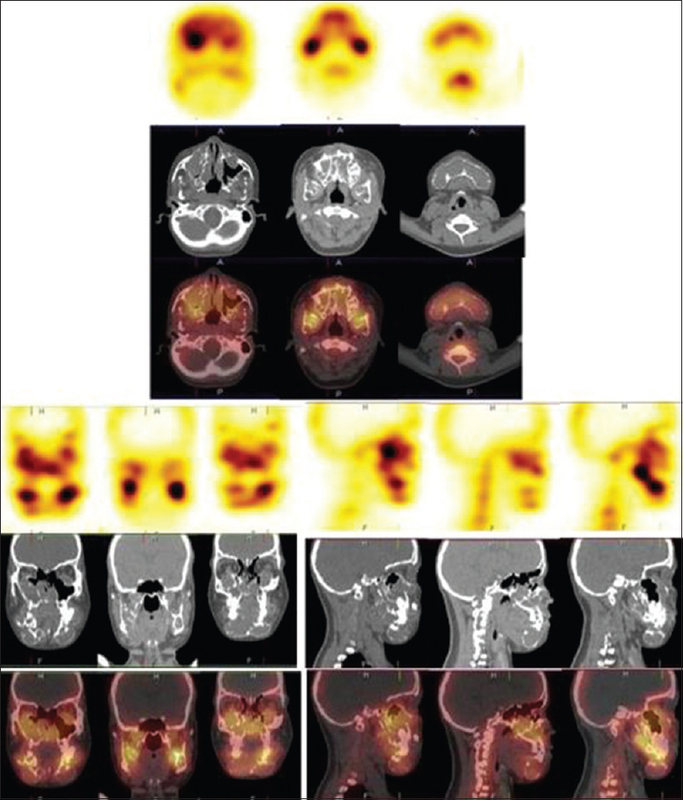 Single-photon emission computed tomography (SPECT) study with low-dose CT of the skull and neck region showed diffuse heterogeneously increased tracer concentration corresponding to symmetrical, expansile, multiloculated cystic lesions with soap bubble appearance and soft-tissue component within involving the mandible and bilateral maxilla. The lesions were predominantly of medullary origin with few interspersed areas of cortical erosion and destruction as well [Figure 4]. Scintigraphic and SPECT-CT features were suggestive of Cherubism. Due to radiological similarities between Cherubism and fibrous dysplasia, previously Cherubism had been considered as a subtype/variant of fibrous dysplasia, specifically a hereditary craniofacial fibrous dysplasia. However, recent genetic analysis has shown them to be separate entities. According to the classification system established by Fordyce, this case was delineated as Grade III type Cherubism. Craniofacial fibrous dysplasia, brown tumor of hyperparathyroidism, Jaffe-Campanacci syndrome More Details, mandibular tumors, and familial gigantiform cementoma were the radiological differential diagnosis for Cherubism. Cherubism and craniofacial fibrous dysplasia may be distinguished clinically and histologically. Features more specific for the diagnosis of Cherubism include bilateral mandibular involvement, limitation to the maxilla and mandible and involution at the time of puberty., In contrast, patients with craniofacial fibrous dysplasia generally do not present with swollen cheeks, the upward turning of the eyes or dental derangement. Brown tumor and Jaffe-Campanacci syndrome can be readily distinguished based on PTH levels and clinical grounds, respectively, and are easily eliminated from the differential diagnosis. Furthermore, gigantiform cementoma lesions are located primarily in the maxilla and are enlarged in a focal rather than diffuse manner. Another close differential diagnosis to be considered should be McCune-Albright syndrome More Details (MAS) which consists of at least two of the following three features: (1) Polyostotic fibrous dysplasia (PFD), (2) Café au lait skin pigmentation, and (3) autonomous endocrine hyperfunction (e.g., gonadotropin-independent precocious puberty). Other endocrine syndromes may be present, including hyperthyroidism, acromegaly, and Cushing syndrome. In our case, even though the patient had discolored skin spots suspicious of café au lait pigmentation, Tc99 m-MDP bone scintigraphy showing the skeletal involvement of only maxilla and mandible, the absence of precocious puberty, normal cortisol levels and history of hypothyroidism helped us to rule out MAS. Diagnosis of Cherubism is usually based on the symptoms, physical examination, family history, and imaging (panoramic X-rays and CT scans). 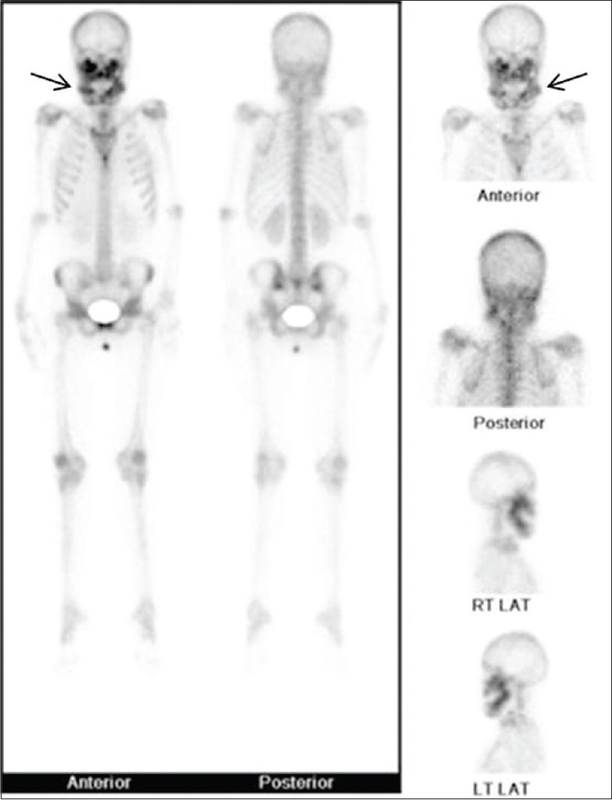 The role of Tc99 m-MDP bone scintigraphy is to rule out multifocality or polyostotic involvement of the skeletal system which can be subclinical. With the integration of SPECT with low dose CT to Tc99 m-MDP bone scintigraphy, treating physicians can avoid doing separate CT scans for lesion characterization and do bone scintigraphy with SPECT-CT as single imaging workup, hence avoiding unnecessary cost, time, and radiation exposure to patients. Cherubism is a rare benign bone disease, and the signs and symptoms of disease depend on the severity of the condition. Because of the genetically determined course of Cherubism, any surgical removal should be exclusively restricted to specific indications. Both scintigraphic and radiological imaging becomes mandatory for establishing the diagnosis. With the integration of SPECT-CT with bone scintigraphy, separate radiological imaging can be avoided and hence reducing the overall cost, time, and radiation exposure to the patients. Moreover, whole-body bone scan will serve as an effective tool to rule out other bone involvement in the axial and appendicular skeleton and narrow down the diagnosis. Jones WA. Familial multilocular cystic disease of the jaws. Am J Cancer 1933;17:946-50. Jones WA. Further observations regarding familal multilocular cystic disease of the jaws. Br J Radiol 1938;11:227-41. Reade PC, McKellar GM, Radden BG. Unilateral mandibular cherubism: Brief review and case report. Br J Oral Maxillofac Surg 1984;22:189-94. Riefkohl R, Georgiade GS, Georgiade NG. Cherubism. Ann Plast Surg 1985;14:85-90. Ozkan Y, Varol A, Turker N, Aksakalli N, Basa S. Clinical and radiological evaluation of cherubism: A sporadic case report and review of the literature. Int J Pediatr Otorhinolaryngol 2003;67:1005-12. Khalifa MC, Ibrahim RA. Cherubism. J Laryngol Otol 1988;102:568-70. Batsakis JG. Tumors of the Head and Neck. Baltimore: Williams and Wilkins; 1974. p. 308. Kalantar Motamedi MH. Treatment of cherubism with locally aggressive behavior presenting in adulthood: Report of four cases and a proposed new grading system. J Oral Maxillofac Surg 1998;56:1336-42. Arnott DG. Cherubism – An initial unilateral presentation. Br J Oral Surg 1978;16:38-46. Bianchi SD, Boccardi A, Mela F, Romagnoli R. The computed tomographic appearances of cherubism. Skeletal Radiol 1987;16:6-10. Mangion J, Edkins S, Goss AN, Stratton MR, Flanagan AM. Familial craniofacial fibrous dysplasia: Absence of linkage to GNAS1 and the gene for cherubism. J Med Genet 2000;37:E37. Bhattacharya S, Mishra RK. Fibrous dysplasia and cherubism. Indian J Plast Surg 2015;48:236-48. Marck PA, Kudryk WH. Cherubism. J Otolaryngol 1992;21:84-7. Yamaguchi T, Dorfman HD, Eisig S. Cherubism: Clinicopathologic features. Skeletal Radiol 1999;28:350-3.